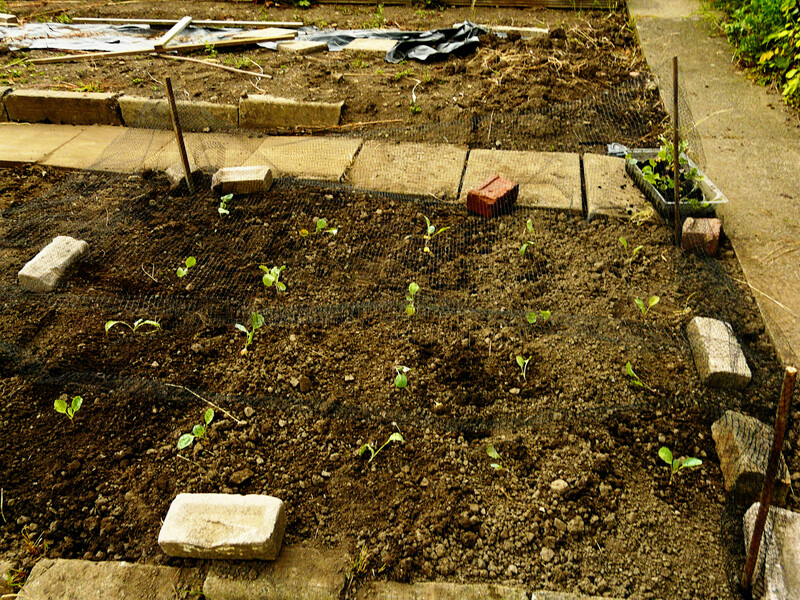 Plot 23b – Veggie Update! What a busy few weeks! We’ve been kept away from the allotment over the last two weekends due to plans with friends and as a result the heavy duty clearance work has taken a back seat in favor of a post-work watering schedule in order to save the baby plants from the July heat. Hopefully (I use the word loosely), we’ll be back up to our elbows in grass and weeds this weekend before it all starts to creep back too much. Without further ado, onto the plants! Our little cabbages are coming on leaps and bounds with new leaves unfurling every time we visit. We’ve had some slight slug damage to one or two. Organic deterrents have been researched to try and ensure that we don’t lose any to the slime army before they’re big enough to survive a slight nibble. Hopefully some sunken jars of beer should prove more attractive than our plants. 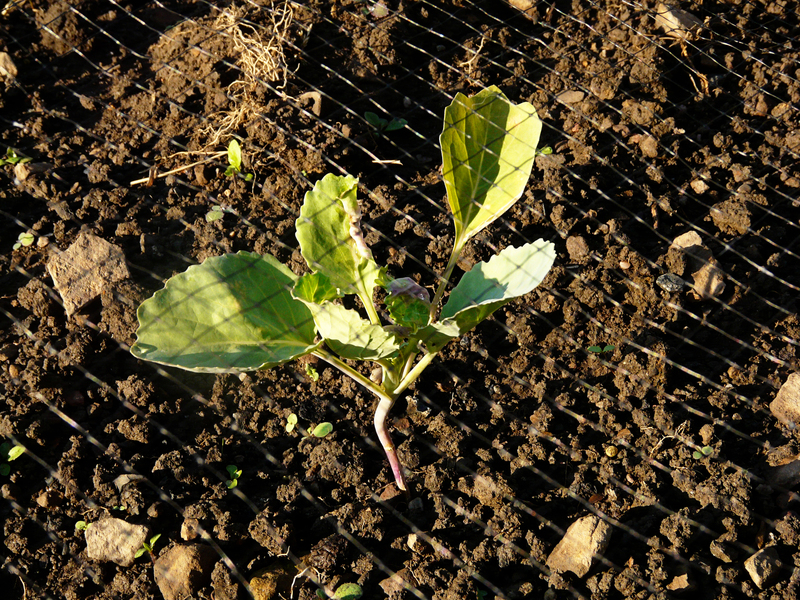 We planted some swiss chard seeds just over a week ago and they’re already poking through!! 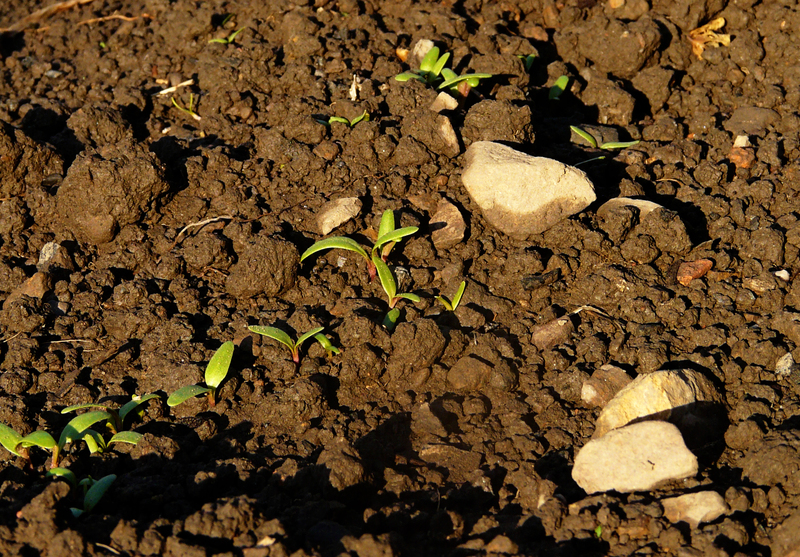 This is the first thing we’ve grown from seed and it was so exciting coming up the path and seeing something poking out of the earth that a) wasn’t a weed and b) something that we’d put in the earth ourselves! Hopefully it will continue to stretch up towards the sun and we’ll have lots of leafy chard by the end of summer. The broad beans are doing well apart from the fact that they have a touch of blackfly, particularly the tall one on the middle left. I’ve read that a solution is to mix up some washing up liquid and water and I’m planning on giving it a go before the flies stunt growth too badly. 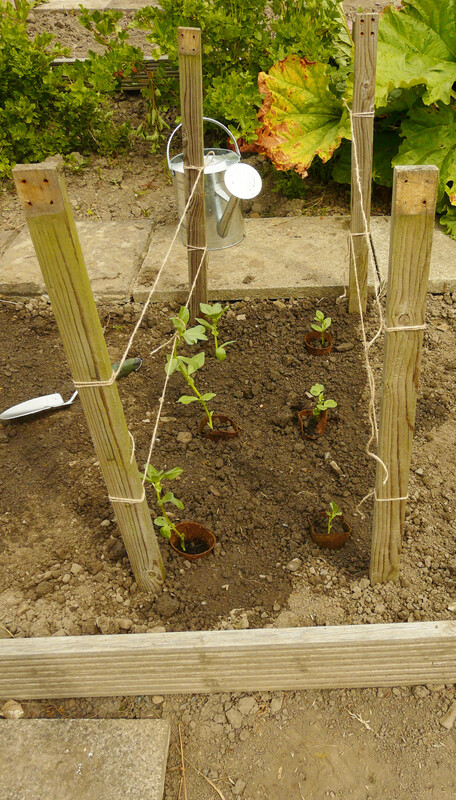 The runner beans are slowly being trained up their supports. The leaves are still a little bit yellow and I’ve read this can be from the shock of being transplanted. Hopefully they’ll get stronger over the next few weeks and we’ll have a nice wigwam covered in those lovely volcanic red flowers. Lastly, I think it’s fairly safe to say we have clay soil. 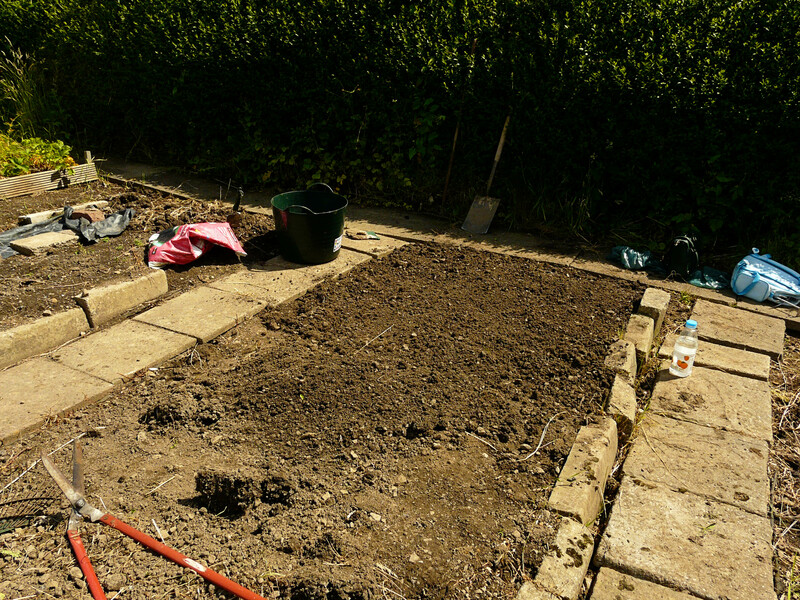 We were starting to dig over a compacted bed in order to get it ready for some carrot seeds. It turned out to be a lot more compacted than we first thought and this was found about half a spade length down. If we can’t get through it will a spade then goodness knows how carrots are going to force their way down! Suffice to say we have a lot of back breaking work before any roots vegetables can go in. This also slightly complicates my dream of having a lavender hedge at the bottom end of the plot, a lot of rubble will need sourcing and digging into a trench in order to give any lavender the drainage that they need. Hopefully the weather will continue to improve throughout August and life will continue to keep springing from the earth ready for my pot and my plate. 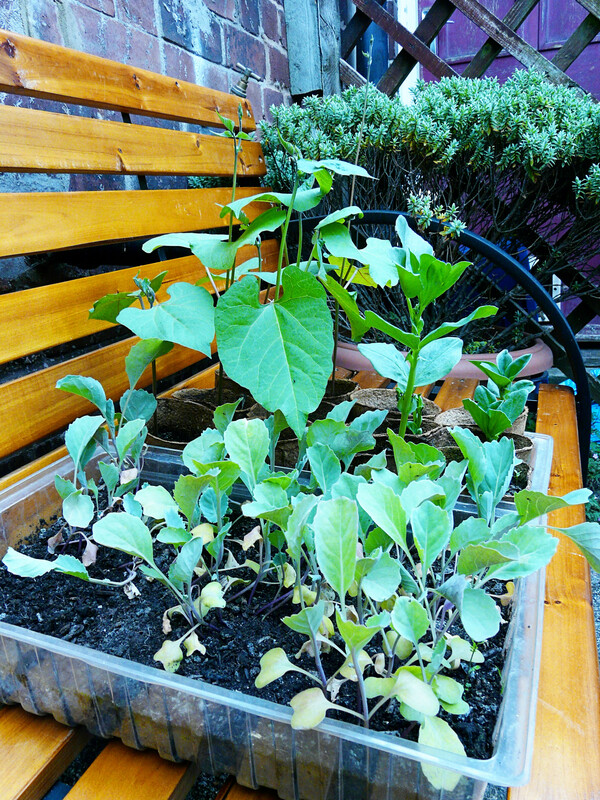 Leave a comment Plot 23b – Veggie Update! Just two weeks into having the allotment and the first veggies are in the ground! I always knew that I want to try my best to catch the end of the nice weather this summer in order to get some delicious goodies growing but it’s certainly going a lot faster than I envisaged. These plants came from my Grandparents, they have a veg plot in their garden and donated us some cabbages, runner beans and broad beans. Here’s the cabbage bed, I dug it over and incorporated a small amount of compost just to give them a boost. Admittedly after this photo was taken I raked the ground for a solid 15 minutes to get the earth really fine (and I still wasn’t satisfied). 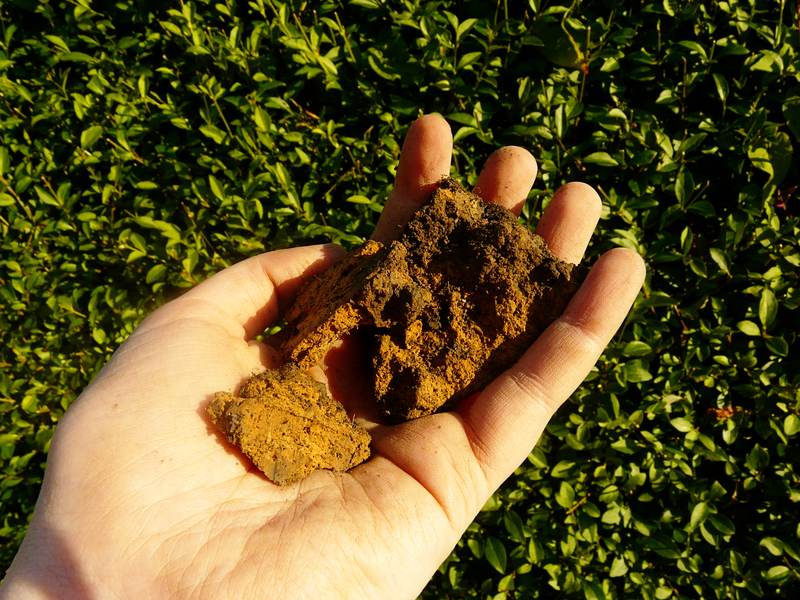 If it’s possible to get obsessive about dirt clods then I’m well on my way there already. Here they are all planted out, 20 in total. I picked out the strongest specimens to be planted out. We re-purposed some netting that we found on the plot to try and offer them some protection from the birds and butterflies. Cabbage eye view. They look so tiny! 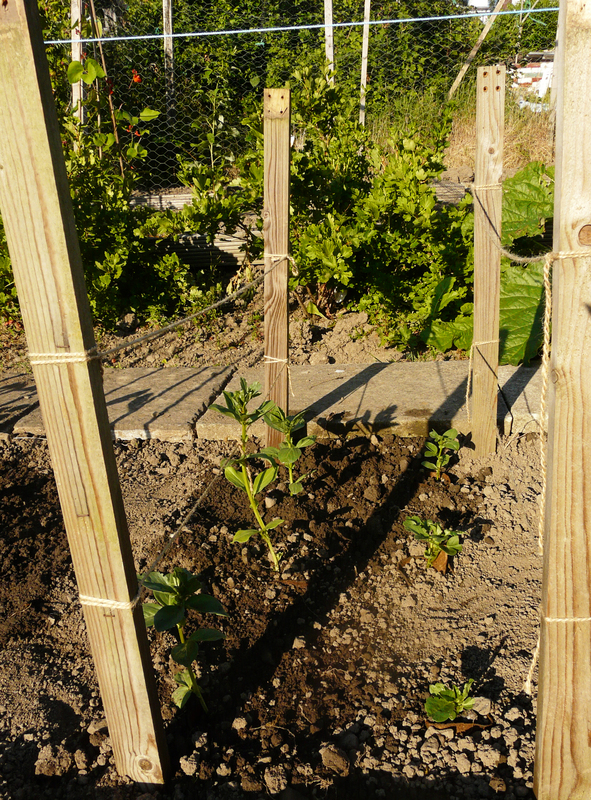 The broad beans were next to go in. I wasn’t sure whether to bury the pots or not so they ended up being left sticking out. If anyone can offer any advice on the best way to plant using these it would be greatly appreciated. 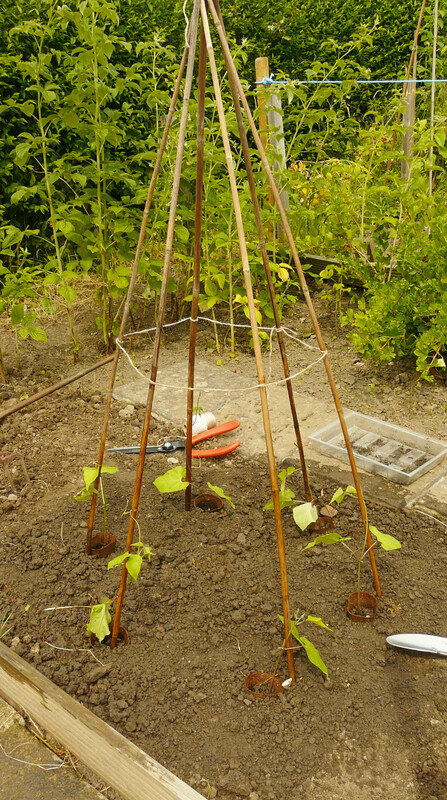 I’m so proud of my runner bean wigwam. I thought it would a lot more unwieldy to make but I got it on the first try. Now I just need to persuade my little beans to cling onto it and grow to the top. All of these will take a few months till we get any harvests from them. In the meantime I have a bumper seed order on it’s way with some quick growing cut and come again salad leaves so we’ll hopefully have some produce on the plate before the end of August. I can’t wait! !